Those splendid chaps over at NeoOffice have released the first completely free beta of version 2.0. NeoOffice is OpenOffice with a Java-based Mac front-end; this means that you don’t need to run X11 to use it, and it integrates rather better with many Mac features – most notably the native Mac fonts and printing. NeoOffice has been around for some time, but it is now based on OpenOffice v2, which means that it’s the best solution for Mac users wanting to embrace the increasingly-important OpenDocument formats. I imagine most people in the States will know about this, but those of us elsewhere who interact with the US regularly may not know about Extended Daylight Savings Time. DST in the US has traditionally gone from the first Sunday in April to the last Sunday in October. This is almost, but not quite, the same as here in the UK, so for the majority of the year, California is eight hours away, except for one week, when it’s nine. From 2007, US DST is being extended by roughly one month, in an experiment which is expected to show substantial energy savings. For 2007, DST will run from Mar 11 to Nov 4. Anyone planning meetings conference calls in the spring might need to know about this… and make sure that any software they use knows about it too! We’ve been playing with a new way to make a single PC into a multi-user machine. It’s based around the idea that a simple USB hub could be the basis of a thin-client terminal. We call it Hubster. More information on the Ndiyo site. Are you a Photoshop user? If so, I heartily recommend John Arnold’s tutorials at Photowalkthrough.com. He takes fairly ordinary images and, in these multi-episode video tutorials, walks you through what he does to them, why, and how. This is fabulous tuitiion, but not for those in a hurry; each tutorial is typically in four parts of 20-30 mins each. But it’s time well-invested if you can get away from other distractions. I watched one on a long flight recently and learned a vast amount. 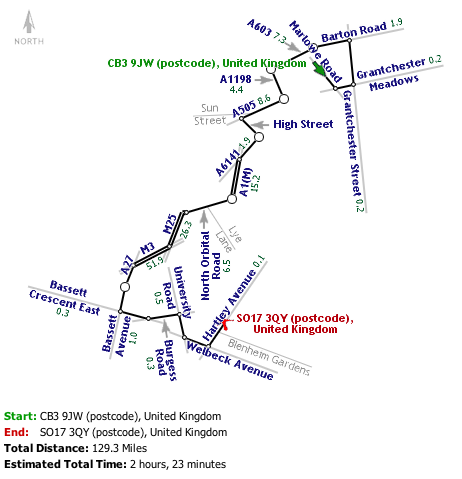 I’ve never used Microsoft’s Mappoint mapping service in the past, but it has a rather neat option when requesting directions, called LineDrive™ – this attempts to produce more useful directions, such as you might sketch for someone on the back on an envelope. Thanks to Christine Herron for the link. I, like many millions of others, have a Linksys WRT54G wireless router at home. Generally, it’s been fine, but recently I’ve found myself having to reset it every few days when connectivity just seems to go away. Updating the firmware from the Linksys site didn’t help. So today I took the plunge and installed one of the free alternative firmware distributions available: DD-WRT. This is a scary process because if it fails for any reason, your router can become unusable and require quite a lot of tweaking to get it back up and running again. And you won’t be able to read web pages about how to do it because you’ll have lost your connectivity. (Well, I suppose you could bypass the router and plug straight into the modem, but it’s still a nuisance.) There’s even a new verb for this – bricking – which means turning your hardware into a brick. Figuring that these alternative OSes wouldn’t be so popular if failure was a regular occurrence, I downloaded lots of files and web pages which would help me recover in case of failure, crossed my fingers, and installed DD-WRT. And… phew!… everything went very smoothly. I’ll need to give it some time to see whether it solves my lock-up problem, but whether it does or not, I’m very impressed so far. The management pages are, if anything, rather nicer than the official Linksys ones, and there are numerous extra capabilities for those who want them. They’re too numerous to list here, but key ones for me include the ability to boost the radio power, to set up static DHCP entries, to monitor the signal strength of wireless clients, and to SSH into the router from outside. Browsing the web also seems noticeably faster to me now. I can’t imagine that overall data throughput has changed – that must be limited by my cable modem speed – so I’m guessing the snappier feel comes from the built-in DNS server which caches entries by default. Graham & Malcolm Gladwell have a nice father-son post about the case for geothermal heating (and cooling). 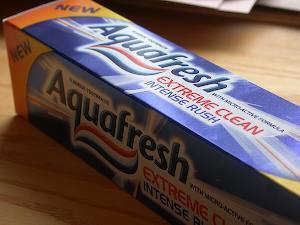 My new tube of toothpaste promises ‘Extreme Clean’ and an ‘Intense Rush’. I’m going to approach it cautiously, never having sought such excitement from a toothpaste in the past. Do you think it’s a typo, and they meant it to say ‘Intense Brush’? The new Dutch Elm Disease? Thanks to David Hopkin for the link. …is that there are so many to choose from. Especially when it comes to Linux distributions. Here’s a nice timeline & family tree of distributions, which makes one realise how hard the decision could be for somebody starting Linux from scratch. And this isn’t complete, by any means. My own favourite at present is Ubuntu, because it has a clean minimalism to it and I don’t care whether or not my desktop looks like Windows. Novell’s new SUSE Linux Enterprise Desktop is very slick and probably worth paying the $50 over the openSUSE version. Interestingly, where many distros have copied features from Windows in the past, SLED, as it’s known, is now copying more from the Mac. A few months back I linked to the multi-touch interaction work that Jeff Han and co have been doing at NYU. Dan Clemens sent me a link to this more recent demonstration by Jeff, from the TED conference. Trust me, this is worth 10 minutes of your time!